Retirement Investing Today: Is it unrelenting or just obsessive? A few things combined have had me trying to answer a question or two over the past day or so. Why do I think I can FIRE (become financially independent and retire early) in less than 10 years, with £1 million, when the vast majority of people won’t ever even think about it, will dream about it and think it’s impossible or will simply fail trying? What right do I have to even consider this when I'm not from money and will certainly have no inheritance to help me on my way? The question becomes even more relevant when I take a step back and think about the strategies I’m employing to get me there – earn more, spend less, minimise investment expenses, minimise taxes and invest in a balanced portfolio of different asset classes that are rebalanced both actively and passively. The strategies are simple and there is certainly no secret sauce in there. A reader last week made the comment that they were resigned to the fact that they couldn't FIRE. This reader is already earning “£2200 a month” after NI/taxes, saving/investing “£750 per month” of it at age 28 but then saying that “I accept that early retirement is not possible”. In comparison I didn't wake up and smell the roses until I was 34, even in real inflation adjusted terms wasn't earning anything like that at 28 and certainly wasn't saving/investing to that level at that age. Yet here I sit today at age 42 with £820,000 worth of investments and a possible retirement age of 44 or so. Just what right did/do I have to think I could/can FIRE at an early age when somebody who is already saving more than me at a younger age doesn't? The comment on the Exchange Rate Conundrum post - “all this endless planning, it's exhausting“ - has been on my mind also. Particularly when what I was doing, trying to minimise risk by thorough planning, didn't seem strange to me at all. So just what is so special about my approach? Why are the principles so simple but the desired result considered so difficult by many? Why did I think I could FIRE when someone saving more than me at the same age of life and who is younger than me when I started my FIRE journey think they can’t? Why is my planning so exhausting for others? Some thinking has identified one natural trait I have in general life which could explain this – I have a natural ability to set a few long term very difficult goals which I don’t know how to achieve when I set them, can plan directionally towards them and can then go at them, even if it takes years, like a Rottweiler until they are achieved. Let me try and demonstrate with an example from one of my strategies – Earn More. 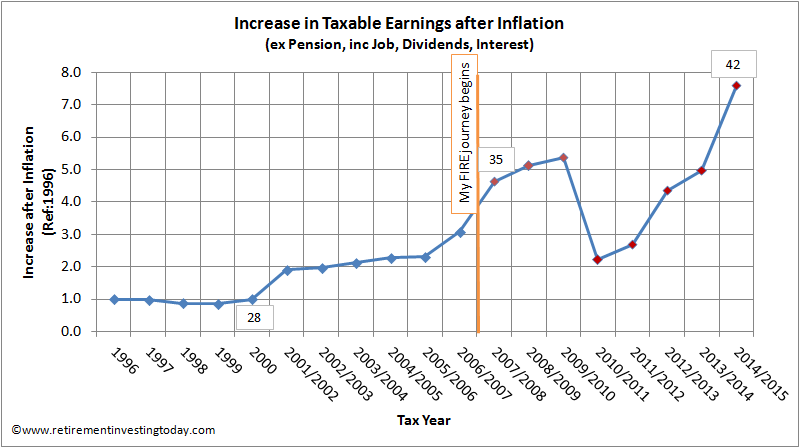 My real (adjusted for inflation) taxable earnings as a multiple of my first graduate salary are shown in the chart below. My records are a little poor pre the 2001/2002 tax year and so here I've just used my basic salary as I know I was saving very little into a pension and certainly wasn't achieving bonuses. Right of the orange line is the period where I have been actively on my FIRE journey. The boxed numbers identify my age in that year. I have been/am prepared to work long hours to get the aggressive targets done on time resulting in readers comments like “holy sh*t - good job you have an escape plan as that is a brutal life you currently have carved out for yourself - 16 hour days!”. Whether I like it or not I have accepted work life is a competition if you want to increase earnings. I therefore make sure that I stay in the top 10% of my peers when it comes to delivery and knowledge which given I'm a 1% inspiration, 99% perspiration type of person forces some of the long hours mentioned above. I have been/am prepared to do the job and then ask for the pay rise. If the rise is not forthcoming I then have the skills and am 100% prepared to move elsewhere. I'm incredibly flexible and do whatever it takes to get the job done. If the floor needs sweeping to ensure a target is hit I’ll sweep it. I'm always on the look-out for the next opportunity that can increase my earnings and it certainly doesn't require a posh job title. I have very strong ethics so always play fair and will never throw anyone under the bus. Knowing that I intend to FIRE does however give me one unfair advantage over my peers that I sometimes feel guilty about. My work life is a sprint (retired by age 44) while theirs is a marathon (retired when the government allows them to) meaning I can run much faster. The end result has been that in the first 11 years of pre-FIRE work I had tripled my earnings but during my relatively short FIRE journey I have now taken that to more than seven times and I’m certainly not finished yet. Importantly this also includes a period where I fell flat on my face, had to pick myself up, dust myself off and crack on. At the start of my FIRE journey did I know my earnings would reach their current level? Absolutely not. Did I think I could earn more than I was currently? Definitely and I set myself a goal of improving them significantly. Can I still earn more before I FIRE? I'm certainly backing myself and going for it. The question then becomes is my approach simply unrelenting (not yielding in strength, severity or determination) and so healthy or is it obsessive (excessive in degree or nature) and so unhealthy? I read this post and thought I could have written it myself. So many similarities, though I'm about half as far dow the line as you. Im very much on the sprint track myself and thankfully so far Mrs GF is too. I have found family life becoming the dominating factor though, so I'm glad I've done the leg work and am making plans for business growth profit that don't require the same level of input as now. If I'm still working as hard in 6 years time and not FIRED, I know I'll have truly messed up somewhere. Thanks for sharing GF and good luck with it. Sounds like we are on very similar timelines given your current financial position. But why? You've spent what will have been your best years of health and energy chained to the desk, or seat-belted in the car. In retrospect will that seem wise? Not that you or I can know the answer. The bit I find interesting is that even though I'm working hard I'm still happier and healthier than I've ever been. I think part of it is that I now really have no financial worries to speak of which is a worry for many. I also dedicate weekends to zero work allowing time for plenty of fun and recharging. Will it seem wise in years to come? I agree with you that I'll only know in the future however right now I'm still enjoying life. It's just a very different one to most people. That was my comment you have addressed. Don't think too much of it -perhaps we have a different outlook, as you could probably tell I am a glass half full type of chap, reinforced by the fact that in the last 3 years I have only saved £27,000 in various vehicles (stocks, cash and bonds) and just cant imagine getting to the million mark as you have by the time I am 42. I mean if my wages rise then it would be possible, but so much of that is out of my hands. I have had to work and continue to work very hard to get to this level of income. Perhaps it will get easier. If I rely solely on things I can control - savings - then by the time I am 42 on my wage, saving at the rate I am now, I will have £126,000 in the bank (in theory, in reality I will diversify). Just over a tenth of what you have achieved. I truly admire what you have achieved, it is incredible. What I fail to see is HOW such a thing is possible from my current situation given the things that I can control. I would also add that what you are doing is entirely healthy - certainly better for ones health than working flat out until 68 like most people will have to! If I could get odds (and I don't gamble) I'd back you to FIRE at some point. Maybe it won't be early 40's but it will be before the government officially allows you to. I'm also a glass half full person (I think a lot of my posts show that) and I think that you're still young, already know the game and already know how to save. You're further ahead than probably 99% of people but you're obviously prioritising other things as well. There's nothing wrong with that - we have to do what's right for ourselves. You say "I have had to work and continue to work very hard to get to this level of income." If you're already working hard then just keep an eye out for that door that is partially open, which may be elsewhere. Even if you use the elsewhere to improve the current. My experience says the opportunities will come. You just have to watch out for them and for me at least I had to do the things I mentioned above to get them. You might have to do other things. In hindsight I've also made some mistakes here and on reflection missed some opportunities so you also don't need perfection to do well. I hope you keep sharing. It's an interesting position you're in and it would be great to know how you get on. Good luck with it! won't you be bored if you actually do Retire Early? you are clearly driven, focussed and successful and could apply yourself to all sorts of things. what will you do with your time when you are Financially Independent? It's something to think about. I retired at 50 and for the first 5 years or so I was doing all the things I'd been wanting to do for many years. Gradually, however, a kind of mild depression rolled in until I eventually realised that I actually missed working. Or you could say that I missed the fight of it or the routine of it or the social side – I'm not sure. I'm now working again, only part time and enjoying it. But, for me, the retirement that I'd planned and worked hard for didn't work out quite as expected. I have retired in my late 40s, but after 3 years or so I did get a bit bored as everyone else I knew was still at work. I enjoyed my job and got some contract work in switzerland for a year, then had another year off, and now have a contract for 6 months+ in London. As I don't need a full time job I can take the risk of having huge gaps between contracts. Contract work pays 4* the rate of permanent work so I probably make more money than I used to do when I was tied to work. It makes a great difference when you know you can stop work tomorrow if you stop enjoying it. It's worth being FIRE for that freedom! You're right, it's not often discussed in the FIRE community. For me, this is why FI is far more important than RE. It's about having the resources to shift the balance of power from being a wage slave to working optionally. I think it will be healthy for me to continue working into my sixties, but without the pressure of relying solely on that income. If The Man turns round one day and says 'that's it, goodbye'. I want to be able to walk away knowing I don't need him anyway! I think your approach is relentless and focused, verging on extreme.If I adopted it, it would be unhealthy for me but I think it's admirable that you are able to sustain it for long periods and be happy and healthy. You positively thrive on this so the one concern would be that you find something that you will be able to thrive on once you reach FIRE and give up your this job. To me you seem obsessive but I acknowledge everyone is different. I also think however you have perhaps more flexibility to increase your earnings capacity. In my job the career structure is flat and there is little scope for increasing income. Me, I want to follow my Dad who retired at 57 from the Civil Service and spent 32 happy years watching sport, reading books, and doing the garden. I'd add travel to the mix, and remove the sport, and aim to do it 7 years earlier, but its pottering for me all the way. "Scientists from the University of Portsmouth found geological evidence that tsunami waves have swept over Malta's coastline - rising to up to 66ft (20 metres) above sea level in some places. They identified 70-ton boulders inland that had been picked up from the seabed before being carried along by the huge waves and dumped far inland. Studies of neighbouring coastlines show there has been a major tsunami, on average, every 400 years, thought to be linked to earthquakes beneath Mount Etna in Sicily, Italy. The north-east coast is now Malta's most densely populated region and if a similar sized wave struck today, it could threaten thousands of people, experts are warning. Many residents and holidaymakers live by or visit the north-eastern coasts, where the towns are built right up to the edge of the shoreline." I think you need to be a little bit unrelenting and/or obsessive to FIRE extremely quickly or you will just run out of steam. I am a bit obsessive but definitely not relenting, and I have kind of run out of steam already if I'm honest. Luckily my plan was never really to reach full FIRE but just get some freedom back as early as possible which has already paid off. 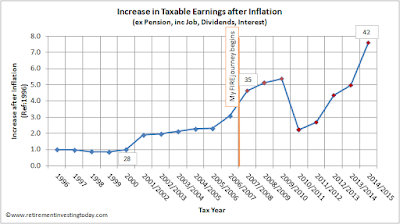 Your pay graph looks very similar to mine, at some point around 28/29 after say 5-6 years in the workforce I decided to get serious about it and the pay rises followed. Now its going back down the other way though (voluntarily) so "unfortunately" I don't think I'll ever get anywhere near the 7 time multiple, but kudos to you for working so hard to get that.